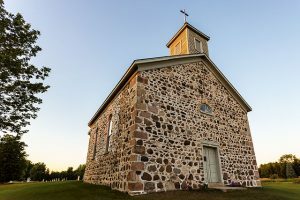 St. Peter's Church, an example of fieldstone construction, was built in 1861. From the Wikimedia Commons. Photograph by Shawn Conrad. CC BY-SA 3.0. 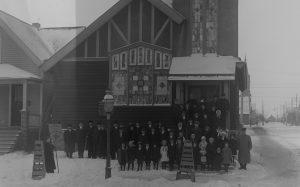 In this 1916 photograph, a group of people are gathered in front of the St. Peter's Polish Methodist Church on South 12th Street. The building still stands today. 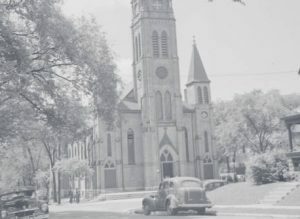 St. Rose Catholic Church served many of Merrill Park's residents after its 1888 construction. The interior of St. Sava is decorated with ornate, colorful mosaics imported from Italy, as seen here. From Flickr. Photograph by username milomingo. CC BY-NC-ND 2.0. 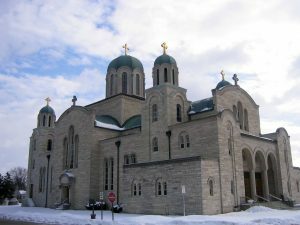 Photograph of the St. Sava Serbian Orthodox Cathedral taken in 2016. 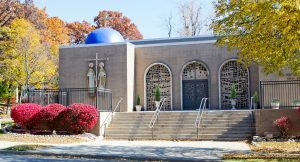 Completed in 1958, the church is a key aspect of Milwaukee's Serbian community and includes a school and other cultural organizations. 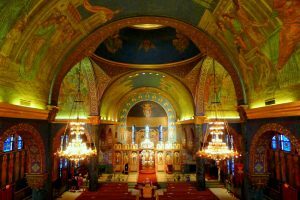 Completed in 1958, St. Sava remains a centerpiece of Milwaukee's Serbian Orthodox community. From Flickr. Photograph by username ribarnica. CC BY-NC 2.0. 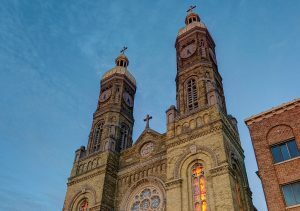 2015 photograph of the front entrance to St. Stanislaus Parish in the historic Mitchell Street District of downtown Milwaukee. From Flickr. Photograph by Flickr username Digidave. CC BY-NC-ND 2.0. 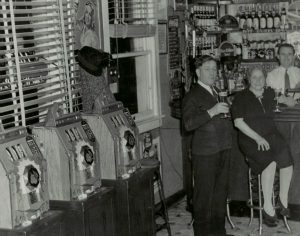 In this photograph from 1942, three slot machines line the wall of the Star Bar and Grill Room in Kenosha County. 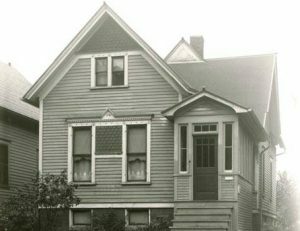 From the Wisconsin Historical Society, WHS-34262. Reprinted with permission. 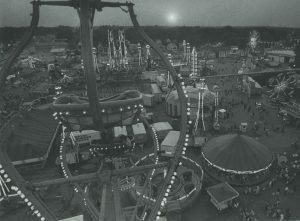 A view of the Wisconsin State Fair from atop the giant Ferris Wheel in 1971. 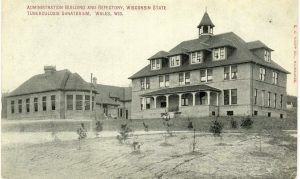 Located near Wales, the Wisconsin State Tuberculosis Sanatorium opened in 1907. It closed in 1957 and reopened in 1959 as the Ethan Allen School for Boys. From Flickr. Photograph courtesy of Scott Paschal. CC BY 2.0. 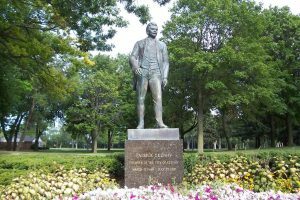 Patrick Cudahy, depicted here in a 1964 sculpture, shaped the city throughout the early 20th century. From the Wikimedia Commons. Photograph by Wikimedia username Sulfur. CC BY-SA 3.0. 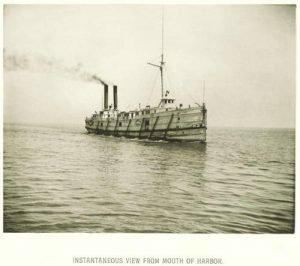 Photograph of a Union Steamboat Company vessel in Milwaukee Harbor, circa 1885. From Milwaukee Illustrated, Special Collections, University of Wisconsin-Milwaukee Libraries. Photograph of a Polish flat taken from the street in 1935. This house was built in 1900. 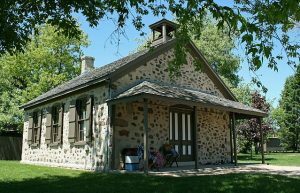 On June 14, 1885, the nation's first observation of Flag Day was held at Stony Hill School in Waubeka in the Town of Fredonia. From the Wikimedia Commons. Photograph by Kevin Hansen. CC BY-SA 3.0. 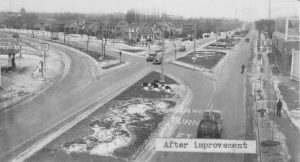 This 1934 photograph displays houses in Story Hill neighborhood, as well as the recently improved intersection of North Story Parkway and West Wisconsin Avenue. 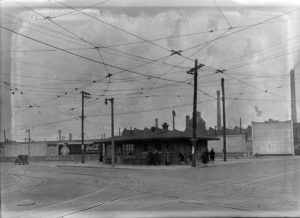 People wait for a streetcar in this 1932 photograph showing a station, the tracks embedded in the street, and the electrical network overhead. 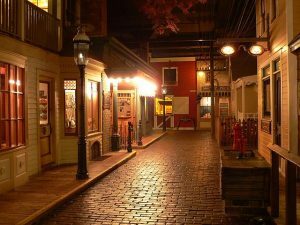 Photograph of part of the popular museum exhibit Streets of Old Milwaukee. It opened in 1965 and was one of the world's first walk-through dioramas. 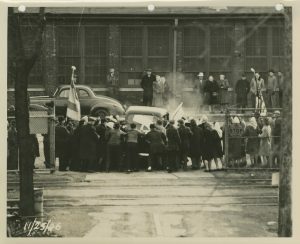 Picketers try to prevent a car from entering the Allis-Chalmers factory, November 25, 1946. United Auto Workers Local 248 waged a 13-month strike against the company from April 1946 to May 1947. This picture was in company testimony before the U.S. House of Representatives Committee on Education and Labor, February 24, 1947, alleging the union was dominated by Communists. From the Harold Story Papers Collection of the Wisconsin Historical Society. Reprinted with permission. 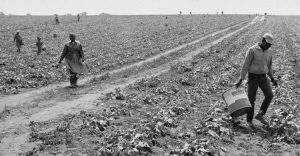 Migrant laborers leave a cucumber field in Portage, Wisconsin in 1967 as part of a strike organized by the Obreros Unidos labor union. Obreros Unidos leader Jesus Salas was appointed as the director of UMOS in 1968. From the Wisconsin Historical Society, WHS-91709. Reprinted with permission. 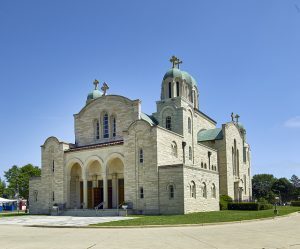 Photograph featuring the front entrance to Sts Constantine and Helen Greek Orthodox Church located in Waukesha. Photograph courtesy of Sts Constantine and Helen Church.